Anchors are right at the heart of cruising. They allow remote and wonderful places to be visited, without the benefit of a solid dock or even mooring buoy. But the true test of a vessels ground tackle system will come in adverse weather conditions when it is needed most with no options available. A very simple rule for anchor choice is: bigger is better. But bigger also means more inconvenience in handling. And besides size, also the type of anchor may significantly influence the holding power of the ground tackle system. Given the great variety of anchor grounds and the complicated process of deploying an anchor on the seabed, it is clear that there does not exist such a thing as the “best type of anchor”. Each type of anchor has its own individual strengths and shortcomings. So at least two anchors of different designs will be available on board to handle the varying anchoring conditions. Also convenience of handling is an issue. It should be feasible to easily re-anchor in bad weather conditions, should the wind direction change, or should the yacht begin dragging. And while sailing coastal waters, at least one anchor system will be kept ready for deployment in case of emergency situations. The anchor must dig in rapidly, regardless of the type of sea bottom. The anchor must bury itself deeply within the bottom. Once set, the anchor must give the maximum holding power without dragging. If the traction force exceeds the bottom holding characteristics, the anchor must offer constant, and maximum, resistance to dragging – even if it moves under extreme load. The anchor must keep on holding, regardless of the shift in direction of either the wind or the current. The anchor design must not allow the anchor rode to become snagged by the anchor. The anchor must be built strongly enough to withstand very high loads. Anchor tests conducted for the yacht and boat market usually do not represent the real world. Varying wind, wave and current conditions require that an anchor should set quickly and reliably however dropped. It should then provide sufficient holding pull without breaking out, even when forced to veer over 180 degrees. An anchor that gives lower straight-line pull performance, but continues to provide that performance when veered 180 degrees is a safer choice than an anchor giving outstanding straight-line performance but zero performance if it breaks out when veered and cannot be guaranteed to reset. In the real world of anchoring, a boat at anchor exerts fluctuating pulls on its anchor. This enables the anchor to embed deeper. How much deeper will be affected by whether the anchor has roll stability or not. Lack of roll stability will affect the anchor’s vertically projected fluke area and therefore embedment capacity: the more an anchor is rolled to either side , the less its embedment capacity. Some large-vessel cruisers use a Fisherman (sometimes called Yachtsman or Herreschoff) as a storm anchor. These old fashioned anchors rely on weight, and require twice or more the weight of so called “High Holding Power Anchors” described below. Although Fisherman anchors are awkward to stow, carry, and use, they hold exceptionally well once they are set. They work well in a variety of bottoms, and unlike many other anchors, they will cut through heavy weed and catch where there is only a shallow layer of mud or sand over rock. Some Fisherman anchors can be disassembled into three pieces and thus are more easily stowed. The Lloyd’s Register of Shipping (England) as well as the Germanische Lloyd (Germany) have approved a set of anchor types referred to as “High Holding Power” anchors. These types of anchor yield a their holding power more from their special shape and construction as from their weight. These types include for example CQR, Delta, Danforth, Bügel Anchor and Spade anchors. “High Holding Power” (HHP): The anchor must hold at least twice that of a standard stockless anchor of the same mass. “Super High Holding Power” (SHHP): The anchor must hold at least four times that of a standard stockless anchor of the same mass (or twice that of a recognized classified HHP anchor). As with type approval, HHP or SHHP classification may apply to an entire range of anchor sizes, even if only the larger models are specifically certified and tested. Notice: Most of these new generation certified anchors are patented. Nevertheless there are a lot of cheap copies being offered even by serious chandleries. These copies differ only slightly from their originals in form, dimensions or materials. Sometimes it is even hard to distinguish the copy from the original! But details are important for these “high-tech” anchors and different anchor tests have shown that those copies perform considerably worse compared to the original models. It is fatuous to save a relatively small amount of money on the anchor rode if this is compared to the value of the yacht and crew it is eventually supposed to secure. Plow-type anchors typically have two articulated plow-shaped flukes joining in a sharp tip. They are inherently designed to ridge the seabed with high resistance, not necessarily to remain fixed in one position until they break out. CQR: The genuine CQR anchor (Coastal Quick Release) developed in the 1930’s, for a long time has been the first choice of most blue water cruisers as a primary and storm anchor for its high holding power in mud, sand, pebble, rock, grass and coral. Its sharp tip and the shank’s angle enabled the CQR to penetrate through grasses and seaweed into the bottom. The long lever arm of the shank made it easy to break the anchor free for hoisting. The hinge joint allows some degree of rotation to either side, helping to keep the anchor dug in when the boat swings on a changing wind or tide. The drop-forged high-tensile steel CQRs are strong and robust. From a modern perspective, performance issues with the CQR are evident in all aspects which define a good all-round anchor, including inconsistent and poor setting performance, poor holding in soft bottoms, and failure to penetrate in hard ground. The CQR does not tolerate weed or grass well, and generally has few redeeming features. The genuine CQR brand is now owned by Lewmar but with the design out of patent there are many poor copies abound, most of them showing even worse performance and questionable construction quality. My personal experience with this type of anchors (on charter yachts!) is that they do not set easy – commonly not setting at all. Due to the weight of the joint, the CQR anchor often drops on its side and then it will skip over the bottom instead of setting when the boat slowly pulls back. Especially in bad weather conditions with gusty winds which make well-controlled pulling back almost impossible, it may require many repeated anchoring manoeuvres before the CQR anchor finally sets. Delta: The Delta anchor was developed in the 1980’s. It is a fixed-shank plough as used for the CQR but with more careful balancing of the anchor’s weight and shaping of the rear end of the fluke in order to permit self-righting and better guide the anchor through the setting process. The basic shape of the fluke nonetheless remains a plough-share, with a brake-pressed plate heel and solid steel cast tip. This design necessarily relies on tip-weight for ballast and setting, an inefficiency which detracts from fluke surface area and ultimate holding power. The genuine Delta brand is now also owned by Lewmar. The anchor is now out of patent resulting in many poor copies abound, most of worse performance and questionable construction quality. Kobra: The “Kobra 2” is very similar to the Delta anchor: it has a hollow ploughshare design of folded and welded steel with a heavily weighted tip and a reinforcing bar underneath to keep the ploughshare wings apart. The difference to the Delta anchor is that the shank of the Kobra can be pivoted to allow more compact stowing. But unlike the CQR, the shank can be locked in a fixed position while in use. The Kobra yields enhanced holding power from its weighted tip and very broad shoulders. Danforth: This popular burying anchor has wide, sharp, plate-type flukes. These anchors are comparatively light and hold well in a soft bottom of mud or sand with a straight pull. It was developed by Richard Danforth with the current form patented in 1948. The flat plate of the flukes, built from steel and able to achieve a strength and durability unavailable in the past to engineers working with cast iron, allow a large surface area for minimal weight. Nevertheless the Danforth type anchor has some issues: Because the flukes lie flat on the seabed before setting, the process of encouraging it to set depends on the tip of a fluke achieving an initial bite which on hard sand or grassy sea-beds is not a given. In this case it will skate along the surface without setting at all. There is also the problem of a reduced strength and durability. Even with good quality construction and high-tensile steels or aluminium alloys, the geometry of the design does not lend itself to a rugged build. The flukes are flat plates with little reinforcement possible, and the tips are easily damaged. Furthermore, Danforth anchors perform bad under veering loads with the anchor be very well set in hard ground such as clay. The large flukes may be sufficiently well stuck that the shank bends before the anchor will re-align itself. But because the Danforth types are flat and relatively light, they tend to be easily stowed, and be set easy from a dinghy. For this reason they are still popular as secondary anchors. They are also the anchor of choice to attach in series to a main anchor, for vastly increased holding power. Fortress and Guardian: These anchors of the Danforth type are made of high-tensile strength aluminum and have an excellent holding power-to-weight ratio, which means they can be lighter than other types of anchors used for the same conditions. Thes fluke-type anchors hold very well in soft bottoms like mud and sand, but tend to slide on grass and skip on rocks. The projecting flukes can be fouled by seaweed, shells, etc., preventing anchor set and are also rather bulky, although some models like the Fortress can be disassembled for easy stowage. The Fortress offers variable fluke angles that can be set for either mud or sand. Bruce: Developed in the early 1970’s by Peter Bruce, the genuine Bruce anchor is no longer produced today and only reproductions remain available under the name “M-anchor”. They feature the proven three-claw scoop design, which is claimed to be effective on short scope, especially in mud and sand. When compared to ploughs and Danforth types, claw-type anchors generally perform better across a somewhat wider range of sea-beds. However, these anchor types do not set particularly well in harder seabeds if the anchor lands upside-down. In this position it relies upon one of the side flukes getting grip on the ground in order to trip the anchor into the correct setting position. This is not guaranteed to happen, and some copies in particular are quite capable of remaining on their back and skating along without ever setting properly. Occasionally setting problems can also occur if a rock or other object gets caught in its ‘scoop’, preventing penetration. The term “New Generation” anchors is used for the anchors specially developed to tackle some issues of the “older” generation and to obtain a combination of superior setting performance, high holding power also under veering loads and a simple and robust mechanical construction. This generation of anchors consist e.g. of the very basic German designed Bügel Anchor, the French designed Spade Anchor and the New Zealand designed Rocna Anchor and some others. The first two have been around for some time now, and have proven vast improvements in general anchoring security. The latter is a newer development and has well established itself in the family of “New Generation” anchors. Experiences from both professional shipping and the yachting community show that these “New Generation” anchors are currently the best general-purpose yachting anchor types showing high holding power on different types of anchor grounds. Bügel Anchor: The “Bügelanker” was developed and patented in Germany by Rolf Kaczirek in the 1980’s and is manufactured e.g. byWASI. It features a hollow roll bar and a single plain fluke, which makes is simple to construct. There are no moving parts and the complete anchor can be constructed in a very robust way. Since its introduction, the Bügel Anchor has been in service world-wide under extreme conditions and proved to be a superb all-around anchor. The ability to quickly set and hold in the most difficult sea bottoms such as mud, clay, shale, gravel, rock and grass is the most appreciated strong point of this truly universal anchor. The WASI GTS (Ground Tackle System) includes a patented anchor-to-chain connectors (“Power Ball”) which are German Lloyd’s certified with guaranteed higher tensile strength than the mated chain. From its construction, the bow anchor is simple and very robust. It consists of a plane, almost triangular, fluke with a hollow bow and a long solid shank at which the anchor chain is attached. 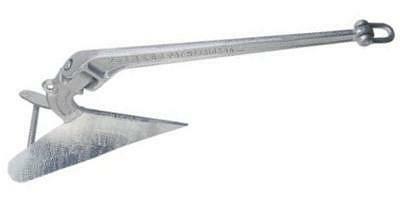 The shank is welded to the fluke in a well defined – and patented – angle. The anchor has no complicated parts and no movable joints making it robust and simple to manufacture. Its stiff shape and sharp fluke point, however, make it hard to stow and also may damage the bow gelcoat while the anchor swings from the bow roller on a short length of chain during heaving or lowering. This may be handled with extended bow rollers. Spade: The spade anchor was designed in France by Alain Poiraud in the 1990’s. It features a triangular, convex blade, coupled with a wedge shaped ballast chamber. The chamber not only ensures that the anchor adopts the right angle for penetration, but positions a large part of the anchors total weight over the tip. A hollow triangular box section is used in the removable shank, to ensure high strength without compromising the weight distribution. 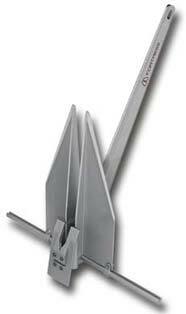 Spade anchors can be easily dismantled into shank and body, for compact storage or transport. 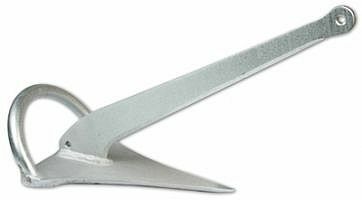 The spade anchor is manufactured in three materials (aluminium, galvanised or stainless steel), and in six sizes. The manufacturer “SEA TECH & FUN” claims that all Spade anchors of the same size, regardless of the weight and material they are made of, will work with the same efficiency. 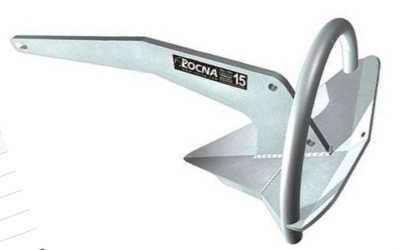 Rocna: Developed in New Zealand by Peter Smith and commercially released in 2004, the Rocna seems to be a modern combination of a Bügel- and Spade anchor and is certified to be a “Super High Holding Power” type anchor, by “RINA” (Registro Italiano Navale). The Rocna design has a roll-bar like the Bügel, which guarantees the anchor achieves the correct attitude every time it hits the bottom. It also has a concave fluke shape, like the Spade, aiming for the optimum resistance given by the spoon form, which maximizes holding power once set. Setting is practically instant on account of the cutting-edge chisel tip and general geometry of the design. There is no additional tip-weight (no bulked steel or lead insert) and the side-profile of the fluke is reduced, allowing ideal penetration in hard or weedy surfaces. This combination gives much better performance on a weight-for-weight basis, while retaining required strength. 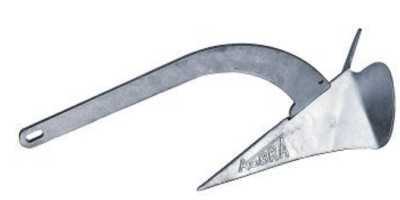 A copy of this type of anchor is the “Manson Supreme”. The Manson anchor has been reviewed by Lloyd’s Register EMEA and it also received a “Super High Holding Power” status. However, Peter Smith the designer of the Rocna anchor claims that The “Manson Supreme” is only a variant of the Rocna type of anchor.